Now that UFC 128 is officially in the record books, the world’s biggest MMA show is steadily filling out the roster for “UFC 130: Edgar vs. Maynard III.” The May 28th event takes place inside the MGM Grand Garden Arena in Las Vegas, Nevada. 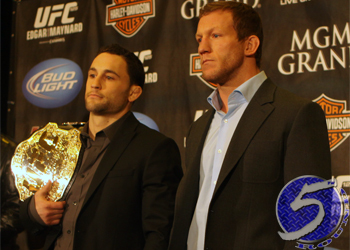 Frankie Edgar will defend his lightweight title against Gray Maynard in the card’s featured attraction. It will mark the third time the 155-pounders have squared off. They kicked off 2011 with a highly controversial draw at UFC 125. Maynard posted a convincing unanimous decision win over Edgar in their initial meeting back in April 2008. Although it has yet to be officially announced, MMAJunkie reported Tuesday morning Spike TV will broadcast two free preliminary fights to start the festivities. If the current bout order holds true, Miguel Torres vs. Brad Pickett and Thiago Alves vs. Rick Story will be featured in the hour-long lead-in show.